NEWCASTLE and Gateshead are set to become two of the hottest spots in the UK after striking a deal to install free Wi-Fi in scores of public areas. After a rigorous selection procedure the Wi-Fi hotspots will be provided by GOWEX, which has already successfully created wireless ‘smart cities’ including San Francisco, New York, Miami, Dubai and Paris. Residents and visitors registering with GOWEX for the service will be able to connect to free Wi-Fi on both sides of the river, at any time of the day or night. Leader of Newcastle City Council Cllr Nick Forbes said: “As superfast broadband rolls out across Newcastle, it will make a big difference to businesses and residents who sign up for it. “But these days, it’s important for people to have access to broadband while they’re on the move too – this investment will put Newcastle and Gateshead in the forefront of UK areas for public Wi-Fi availability. “People will be able to connect to the Wi-Fi hotspots around city and town centre, high streets and public buildings – free of charge. Cllr Malcolm Graham, Gateshead Council’s Cabinet Member for Employment and Skills added: “This is a fantastic boost for businesses, visitors and residents. “Being able to connect quickly and easily to the internet is now such an integral part of business and personal life. GOWEX has a track record in providing public Wi-Fi networks in cities around the world. People will be able to tune in to the hot spots all day and night for free. The bandwidth speed will be fast enough for the vast majority of functions. Under the contract, GOWEX will be installing a large number of connection hotspots, beginning this summer and finishing by the start of 2015. Cllr Forbes said: “We insisted that local labour was used for this project, and we’re pleased to say GOWEX is paying for the work – and maintenance – to be carried out by council staff in Gateshead and by our current streetlight contractors in Newcastle. The councils were assisted in making their choice of GOWEX by consultants Real Wireless. Mark Keenan, Director at Real Wireless, said: “As councils look at how to provide improved wireless they need to seek trusted, independent advice to understand the challenges and the proposed solutions to ensure the best return for their money. GOWEX’s Chief Executive for North Europe, Philip Brown, visited the North East to celebrate the contract at a ceremony held at the Millennium Bridge. Jenaro Garcia, the company’s Chief Executive, said: “We are extremely proud that the City of Newcastle and Gateshead have trusted GOWEX to offer to all their citizens and visitors the best free Wi-Fi service in order to transform them in Wireless Smart Cities. 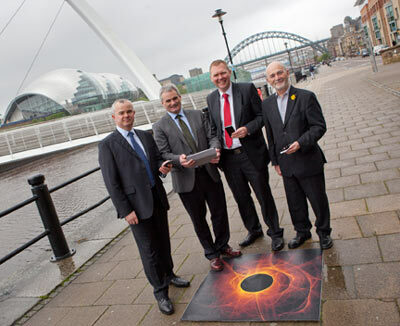 As a further benefit, people who sign up to access the GOWEX-provided Wi-Fi in Newcastle and Gateshead will be able to connect free in other cities around the world where the company operates. The project – which received Government funding from Broadband Delivery UK (BDUK) – is part of the Go Digital Newcastle initiative, which is bringing superfast broadband to 97 per cent of the city by summer 2015. Go Digital Newcastle is a government scheme delivered by Newcastle City Council and is designed to boost the local economy. Small and medium businesses can apply for free vouchers worth up to £3,000 towards the cost of getting their businesses connected to superfast broadband. Businesses can also access a programme of free business support to show them how to make the most of their speedy connections. Specialist advisers will give practical advice and help, including details on how businesses can get a grant of up to £2,000 for related equipment and consultancy projects. The Government’s Super Connected Cities Programme, covers the Broadband Connection Voucher scheme, Wi-Fi in the city and the Cloud Innovation Centre. Communications Minister Ed Vaizey said: “With demand for Wi-Fi skyrocketing, this is tremendous news for Newcastle, one of our 22 Super-Connected cities.